The Best Vacation is a Fishing Vacation! The Best Perdido Key Fishing Charter! I first off want to thank everyone who has taken the time to read this first blog post! I want to start this blog with a writing about my experience with a Perdido Key fishing charter. I contacted Bryant Fields the day before our trip to confirm our trip was a go. From there it was a dream come true! We met at the local marina early and ready to go! From there we left and caught some bait at a buoy at the local channel access to the Gulf Of Mexico. It took a few minutes and we had all the bait we could put in the live well. From there we started our journey for our deep sea fishing adventure. It was glass calm on the way out. We hit our first spot and as soon as our baits hit the bottom we were bowed up with some nice Red Snapper! After catching a limit of Red Snapper we then went fishing for king mackerel and let me tell you these fish fight! We caught three of these fish on live bait on light tackle and it was a blast. One must have jumped 10 foot out of the water! We then moved on to catching some vermilion snapper. Although these fish are smaller, the light tackle and the fight these fish had were a blast! We caught quite a few of these guys and before you knew it our trip was over…. We headed back in where the Captain cleaned our catch and bagged them up for us. It was a great time and was really the staple of our vacation in Perdido Key. We then went back to The Point restaurant where they cooked our catch form our day of fishing. 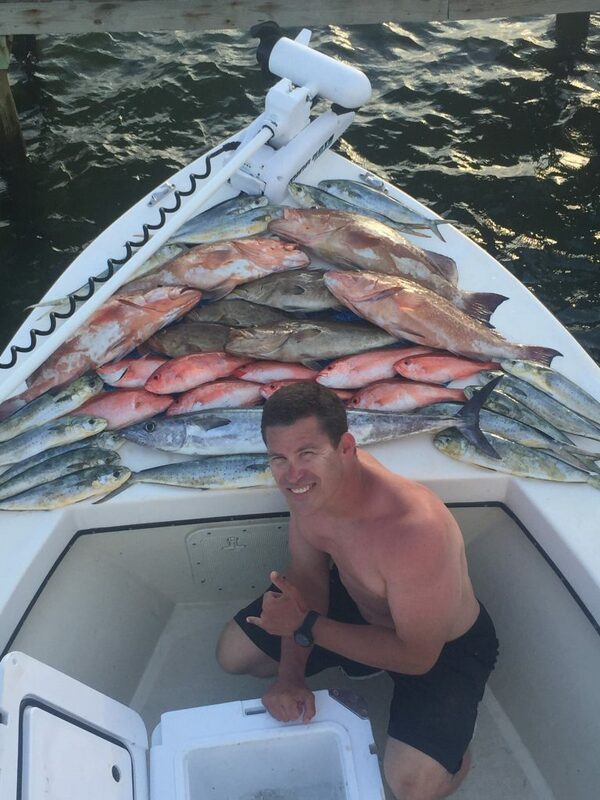 I can’t recommend All Caught Up Fishing Charters-https://www.allcaughtupfishingcharters.com/ enough! It really was a great trip and can’t wait to come back! I hope you enjoyed this reading as much as I enjoyed writing it. The Best Vacation is a Fishing Vacation!, Proudly powered by WordPress.